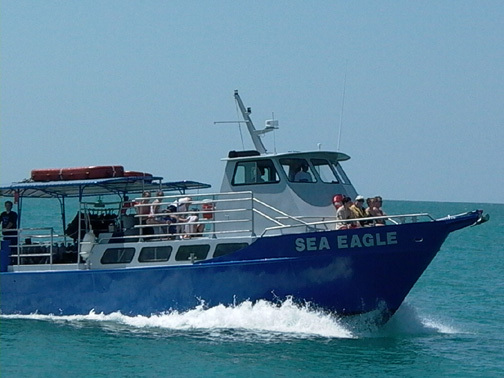 Diving is aboard "Sea Eagle," the James Bond boat from "License to Kill." 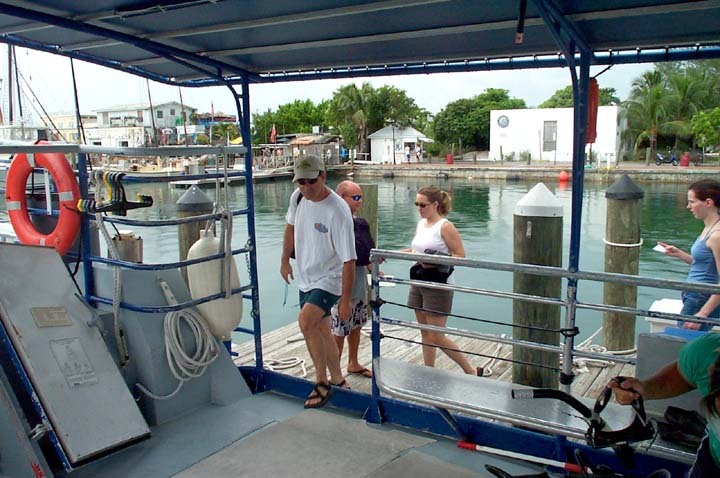 Sea Eagle departs the dock from 631 Greene Street (corner of Greene & Elizabeth Street / next to Conch Republic Seafood Restaurant). See "Find Us" for directions. Check-in is 30 minutes before departure. Departing 9:30 AM. Two wreck dives (usually both at the Vandenberg). Returns approximately 1:15 PM. Departing 2:00 PM. Two dive/snorkel stops at the reef - one hour at each site. Returns approximately 5:30 PM. The reef is approximately six miles offshore - about a 35 minute boatride - and provides a number of locations for snorkeling / diving. Sites are chosen based on daily conditions. "Sea Eagle" has ice water for drinking and a cooler if you wish to bring soda, food or beer (for afterwards only!). The boat also has a fresh water shower for rinsing yourself off, a rinse bucket for equipment, and camera buckets for photo/ video gear. We suggest that you bring a towel, sun screen, a change of clothes and a snack. 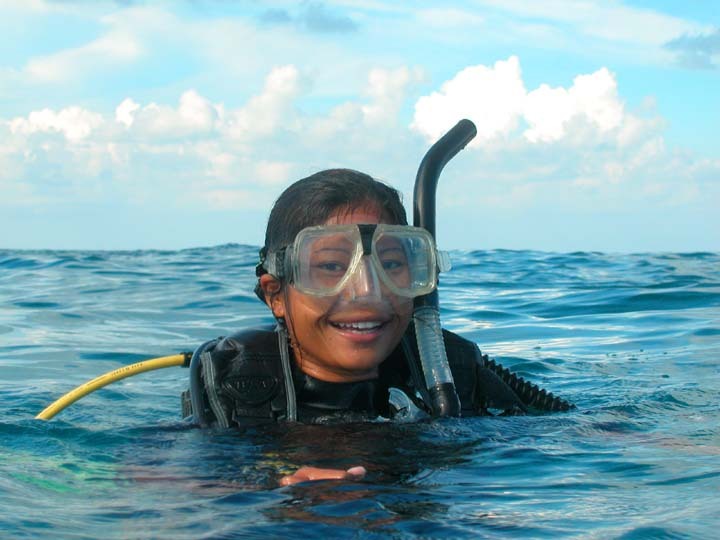 Snorkel trip prices are $ 40.00 per person. Includes equipment rental. We provide instruction for beginners. 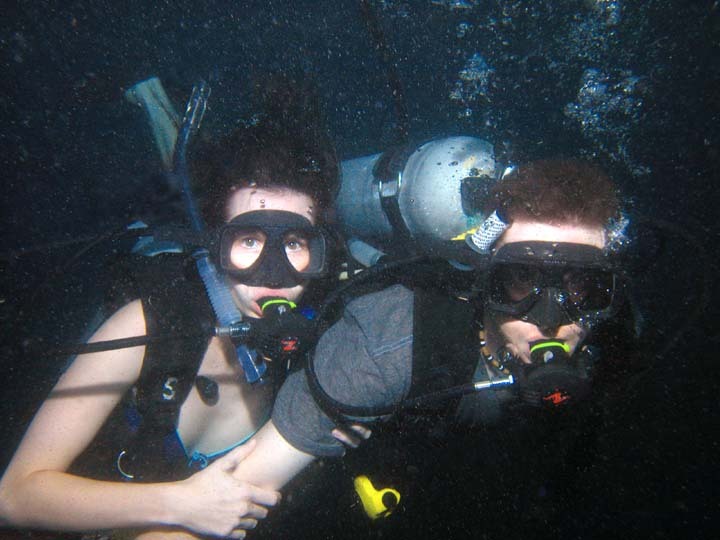 Scuba trip prices are $ 75.00 per person. Prices exclude equipment. Weights, belts, masks, fins and snorkels are included in the price. For customers with their own tanks, air is $ 8.00 per fill. NOTE: Trips to the Vandenberg for divers needing only tanks and weights are $85.00 per person. Corrective lens masks available at no charge. Not certified? 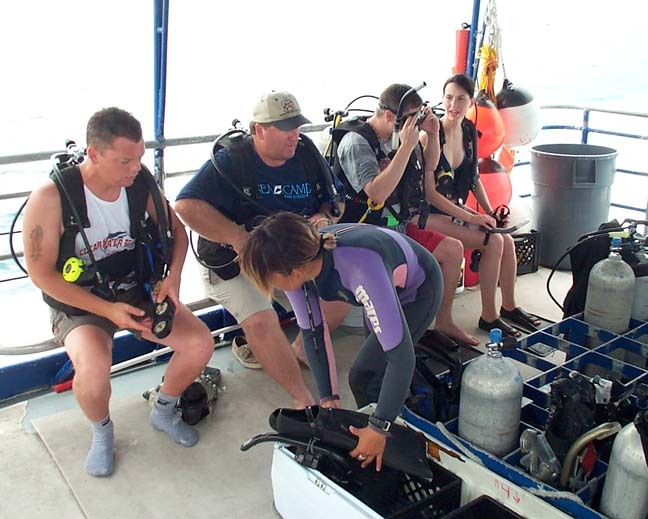 Click here to find out how you can experience scuba diving on the reefs of Key West. 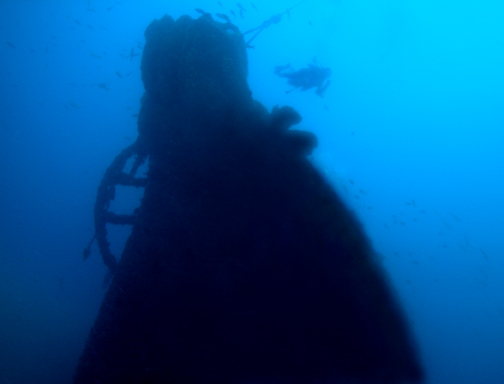 Our newest wreck - the Vandenberg (523 feet long in 140-150 feet of water) - followed by another dive on the wreck or a reef dive. A wreck dive on the Cayman Salvor (189 feet long in 94 feet of water), followed by either an outer reef dive or a shallower reef dive. Two-tank outer reef dives for those who have "been there, done that." Sites include Eye of the Needle, The Humps, Lost Reef, Hammerhead Hill, and Trinity Cove, to name just a few. 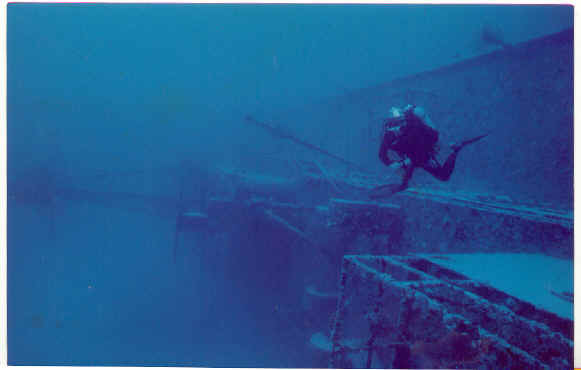 Technical diving charters to some of the deeper wrecks (USS Wilkes Barre, USS Curb, etc.) off Key West. Please contact us for details. We require a minimum number of passengers for all trips. 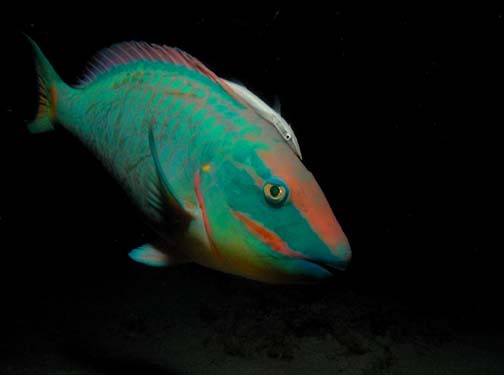 During the summer months, we offer a twilight dive on the Cayman Salvor followed by a shallow night dive on the reef. Night dives are $ 50.00 per trip and exclude equipment. Please contact us for departure times. Check out our Technical Diving page. Trips can be arranged by request. A minimum of six divers is required. We also offer charters, starting at $2500 for the day-long trip, to the site of the English merchant slave ship, the Henrietta Marie, which sank 35 miles off Key West in 1700. Please contact us for details. Note: Prices subject to change without notice. Captain's Corner cannot be responsible for other people booking us at outrageously expensive rates, wrong prices or ridiculously cheap bargains. Our prices are as advertised on this website. Please contact us directly if you have any questions.